If you are creating a few small utility add-ins, you may want to store them under a single tab so your users don’t have a bunch of individual Ribbon tabs strung out across their Office application. I use this technique for many of my add-ins, storing them under a single Ribbon tab called “TSG” (TheSpreadsheetGuru). In cases like this, I recommend keeping all your buttons under one group and using the group name text to store the name of your small utility add-in. You can use separators to break up your button groups. 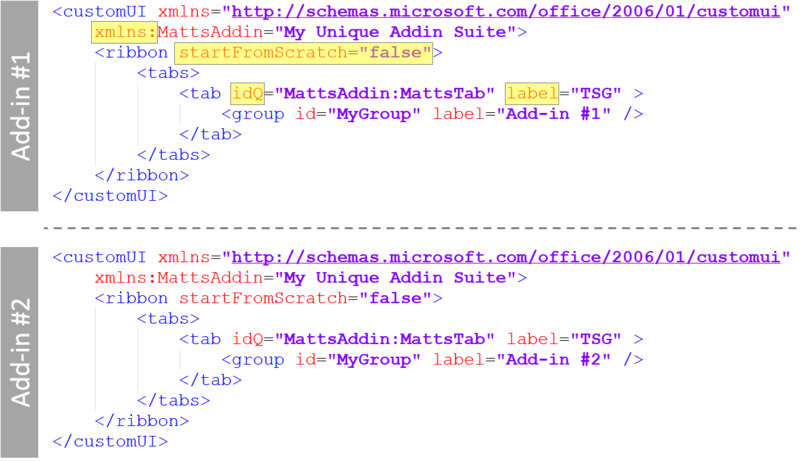 All the work required to share tabs is going to occur in your add-ins Ribbon XML code. In the following section, I will show you the few lines you will need to add towards the beginning of your XML code (via the CustomUI Editor). In the below example snippets I will highlight in RED font text you can change to be whatever you desire. These pieces need to have the same values across all your shared add-ins. The below image shows you an example of two different add-ins that feed into the same “TSG” ribbon tab. More examples can be found below.